My-Alia : Alia's very own.. Japlo! Haha.. what a funny title! 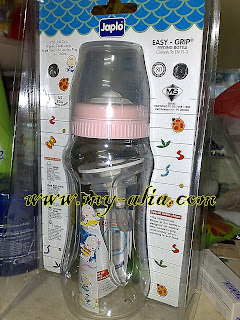 **actually, everytime Danial comes to Au3, one of alia's favourite is danial's bottle! in fact during his last visit, after kek (that's danial's mom) made some milk for danial, alia quickly reached out for the bottle and put it in her mouth! (as though it was hers!).. so my sis said to me: "hang kena beli la sebijik Japlo.. tak mahal, dalam belas-belas ringit je!" i said : "hmm.. tgk la dulu"
Before this, we only buy the one that has disney characters (Pooh, Mickey etc) and 2 bottles were about RM20 .. :) hehe..
**recession has made me become a bit stingy! haha..
japlo pon sama mahal macam Avent. i tatau pun...jarang beli botol kat faris. oh.. ya ka..? hmm.. mahal la depa ni.. sabar je la..
nak tak yaya minum pakai botol tu? a ah la.. biasa lah.. gawat. erm.. so far, dia nak pegang la botol tu.. part minum, sama je.. kalau dah nak tido, baru minum! :) haha..